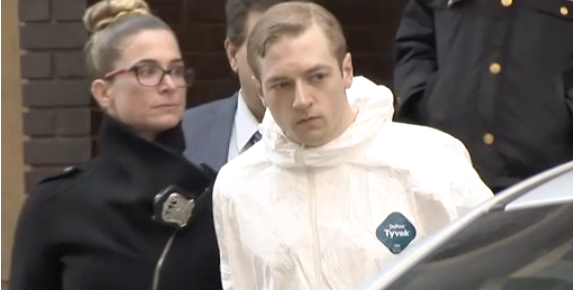 NEW YORK – Police say that the white man accused of fatally stabbing a black man on Wednesday told them the killing “was practice” for a larger attack against black men in Times Square. In the end, however, he chose Caughman. As the 66-year-old bent over a trash bin around the corner from his home, gathering bottles to recycle, Jackson attacked him from behind with a 2-foot sword and walked off, prosecutors say. A bleeding Caughman staggered into a police station and later died at a hospital. On Thursday, Jackson was charged with murder as a hate crime. He said nothing in court. He came to New York last week to make a splash in the media capital of the world by killing as many black men as possible, authorities said. His cousin Seth Peek told The New York Times that in the 1970s and ‘80s, Caughman worked with young people in Queens as part of a youth program.